You will earn 3,551 Reward Points. Earn 1 reward point for every 1 dollar spent. Save Labor and Reduce Breakage By Presorting Soiled Dinnerware Close To The Point Of Service. Bottom perimeter bumper protects walls and doorways. Slanted shelf drain system includes clear plastic drain tube. Large 8” non-marking casters, 2 ea. fixed, 2 or 4 ea. swivel. Built-in food scraper with plastic hanging waste bins available. Shelves are sturdy 14 gauge. Angled shelves are pitched at 20º. 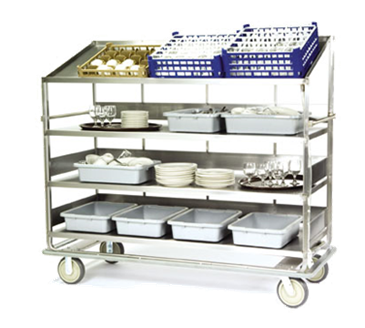 All-welded stainless steel U-frame construction is easy to clean and sanitize. Bottom shelf has slides to accommodate a 12” x 20” x 2” drain pan (not included). Flat shelves feature marine front edge, side and back rails to prevent drippage and accidents. Unit shall be welded stainless steel, with U-frame leg construction. Shelves shall be 14 gauge, and shall be continuously bead welded to 1/8” thick angled legs. Shelves shall be configured in a combination of flat and slanted positions to accommodate trays, pans, dishes (flat) and glass/cup racks (slanted). Flat shelves shall feature marine front edge to prevent drippage, and edges turned up 4” on back and sides. Slanted shelves shall be pitched at 20º, and shall have a drain hole with drain hose to divert drippage from glass/cup racks. Hose shall drain into a 12” x 20” pan (not included) mounted under the bottom shelf. A full-perimeter bumper shall be mounted to frame bottom. An optional (included on models B591, B592, and B593) rubber plate scraper shall be mounted to unit side, and shall be removable for cleaning. Unit shall have six each extra-load plate type casters, two fixed center and four swivel, two each with brake (Model B591 shall have two each swivel and two each fixed casters). Swivel casters shall have shielded ball bearing races and zerk fittings for lubrication of swivel bearings. Caster wheels shall be 8” (203 mm) diameter with 2” wide, non-marking tread. Unit shall be NSF listed.